"Falklands" and "Malvinas" redirect here. For other uses, see Falklands (disambiguation) and Malvinas (disambiguation). The economy of the Falkland Islands is ranked the 222nd largest out of 229 in the world by GDP (PPP), but ranks 5th worldwide by GDP (PPP) per capita. The unemployment rate was 1% in 2016, and inflation was calculated at 1.4% in 2014. Based on 2010 data[out of date], the islands have a high Human Development Index of 0.874 and a moderate Gini coefficient for income inequality of 34.17. The local currency is the Falkland Islands pound, which is pegged to the British pound sterling. 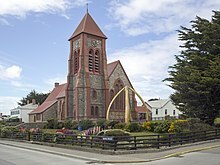 ^ "Falkland Islands Census Statistics 2006" (PDF). Archived from the original (PDF) on 16 December 2019.